Google Ads is an online advertising platform developed by Google. AppsFlyer enables you to track various Google Ads campaigns. The Google Ads UI only allows you to configure an App Campaign. To configure other specific campaign types, contact your Google representative. As a prerequisite for the integration with Google Ads, the app must collect IDFA / GAID. For further information, refer to the SDK Integrations Guides for either Android or iOS. Paste the copied Link ID. To track running retargeting campaigns on Google Ads, Toggle Google Ads Retargeting to ON. If you do not have any active Google Ads retargeting campaigns, it is recommended to toggle this button OFF. Once you enable retargeting, you can set the duration of the Re-Engagement Window (the period when the user's in-app events are attributed to the retargeting media source). You can set the value in days (1-90), hours (up to 23), or even lifetime. 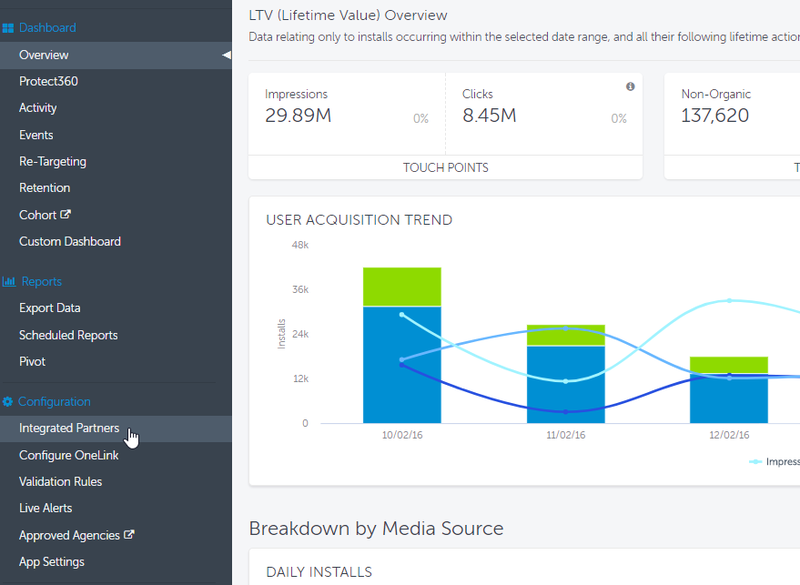 To track clicks and impressions you must configure cost, as described above. To learn about Google ads cost, click here. The next step (step 3) is optional. You don't have to map your in-app events. However, step 4 is MANDATORY! Even if you decide to skip step 3, you still have to go through step 4. When enabling the Google Ads in-app events mapping for an app for the first time, all the af_XXX events from the SDK are automatically mapped to Google's pre-defined event list. This automatic mapping saves you time and decreases mapping mistakes significantly. Don't see the event you want in the list? Make sure to activate the event on a device with a non-organic installation and recheck. We recommend mapping AF app opened with session start for future retargeting purposes. For Google Ads to register your new conversions, you MUST launch your app and perform your mapped in-app events at least once. Afterwards, it may take up to 6 hours until they are added to the queue. Once they are added, you can import them or the new conversions change status from “No recent conversion” to “recording conversion". Congratulations! You are now tracking Google Ads mobile campaigns with AppsFlyer! Please ensure your "include in conversions" setup is aligned with your campaign goals in Google Ads. For more information, consult with your Google representative or refer to the Google documentation here. The Google Ads API integration automatically includes the Google Ads remarketing feature. By completing this integration and sending events to Google Ads you are able to create remarketing audience lists in Google Ads without any additional integrations. AppsFlyer supports agency configurations with Google Ads. It is essential that the advertiser and the agency have separate Google Ads accounts to enable AppsFlyer to correctly attribute the data. For details, click here. AppsFlyer supports working with multiple Google Ads accounts for the same app. This is performed through sharing the Link ID in Google Ads and importing the events into each Google Ads account. For further details on how to share your Google Ads Link ID, click here. The table below is the parameter mapping between Google Ads and AppsFlyer. Advertisers cannot add personalized parameters to any Google Ads campaigns. Set out below in the table is the parameter mapping received from Google. *For more information on what ad types are available in Google's response see here. Google is an SRN (Self Reporting Network). For more information about how the attribution flow works for these networks, click here. AppsFlyer can present any campaign information that is provided by Google. The campaign type (Search, Video, Display) and associated information is determined by Google. For more information, click here. Click Blocking - For Android, AppsFlyer blocks clicks from pid googleadwords_int, meaning they are counted in the system, but ignored for attribution. This tab covers the steps that must be taken to import conversions from AppsFlyer to Google Ads. This process is essential for tracking any conversions, including installs. Conversions are imported from AppsFlyer to Google Ads to allow them to be counted in Google Ads. For AppsFlyer to count Installs (First Opens), these must be imported. To track installs, you must import first_open. To track all other events select the event that you want to track from the list. For events to appear in this list, the event must have occurred at least once after the Link ID has been configured. Please ensure you import the events from Third-Party App Analytics. Importing events from other options does not include AppsFlyer's data. 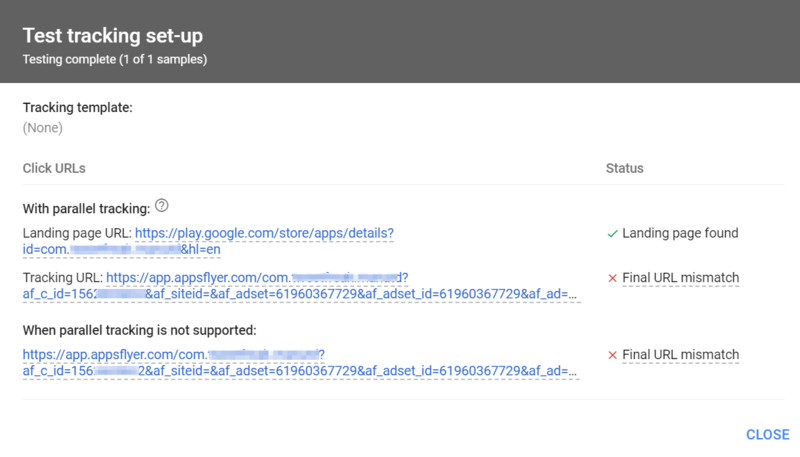 Google is only sent a request when AppsFlyer has the GAID/IDFA. 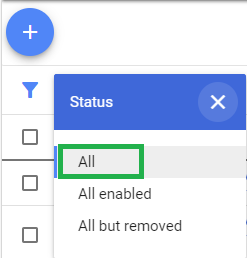 If you have configured in-app events to be sent using the Only events attributed to this partner option, the event must be attributed to Google for you to be able to successfully import it. Otherwise, it is not sent via the API to Google. Multiple accounts must be linked in Google Ads. If a Link ID is generated from account A and traffic is running from account B, the Link ID must be shared from Account A to B, to enable you to import events from both accounts. AppsFlyer supports getting cost, click and impression data from Google Ads. This integration allows you to view and measure your ad spend on Google Ads, and then calculate eCPI and ROI of your Google Ads campaigns. MCC Accounts are also supported. To view Google Ads cost, click and impression data within the AppsFlyer dashboard, connect via your Google Ads configuration page. Once the connection is complete, AppsFlyer begins to query your Google Ads cost amounts, clicks, and impressions for all of your existing campaigns. Click here to see details of setting up cost in Google Ads. After the setup, data should come through within a few hours. AppsFlyer receives cost data seven days retroactively from the first time you log in to the system. Enabling cost also collects clicks and impressions data. The Data in AppsFlyer is shown up to Campaign level. Users can confirm they are logged in with the correct Google Ads account by checking the email address, which appears on the top right corner of the Google Ads dashboard. If the Google Ads account is a sub-account of an MCC account, then the top right ID is the MCC's, and the sub-account's ID is on the top left corner. If it is not the correct account, sign out of the account and sign in again using the email address for a different Google account. Cost by Geo allows you to view cost data based on geographical location. This option is supported for campaigns with installs after August 27, 2018. In the Filter By field, select Google Ads as the media source. In the Group By field, select Group by Geo in the filters. Cost, clicks and impressions by Geo are collected according to the campaigns' targeting. Campaigns with worldwide or proximity targeting show their cost, clicks, and impressions grouped under Geo "N/A". A campaign with specific targeting, e.g. US, can still drive installs from other countries, e.g. Canada. All cost clicks and impressions are tied to the campaign's targeting. Installs coming from GEOs other than the campaign's targeting show cost, clicks and impressions as N/A. Once you set Google Ads cost do not change the name of any live Google Ads campaign, as it may cause serious discrepancies or missing cost data. Why Can't I see my Cost Data? When logging in, it is important to verify the right Google account is used. 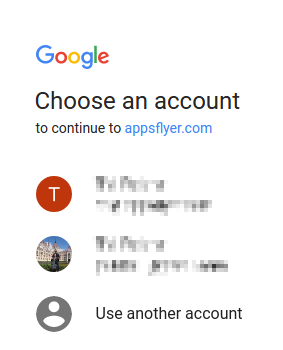 Remove AppsFlyer Cost on Google and login again. Using spaces or special characters in iOS Search or Android Landing Page campaigns may cause issues with matching cost data to click data and leading to missing cost reporting. Where is my Geo based clicks data? In some cases, AppsFlyer receives partial Geo clicks data from Google. When this occurs AppsFlyer completes the missing clicks information from other Google sources, which lack the Geo data. Therefore, when grouping by Geo, the total number of clicks from Google's campaigns, may not match with the same number with another grouping dimension. Event Source - choose the event representing your ad revenue model in the best possible way. The Ad Revenue Event value is automatically created upon your selection. Google sends to AppsFlyer only ad revenue that is generated via the Admob Network. Ad revenue from mediation partners such as ironSource or Unity may be displayed on Google's dashboard. However, Google doesn't send this ad revenue to AppsFlyer. 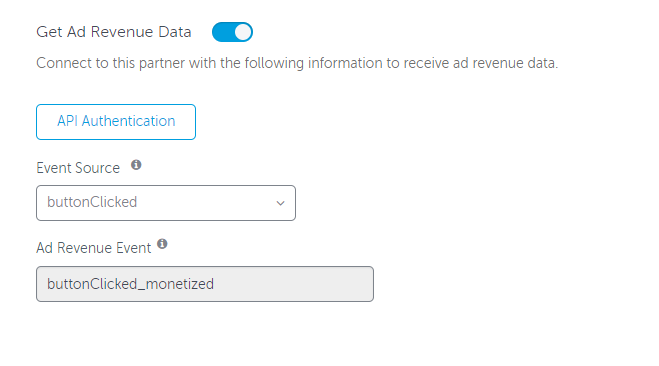 You can configure these partners in AppsFlyer's dashboard to send ad revenue data directly to AppsFlyer. Why am I not seeing clicks from Google Ads? Aggregate clicks and impressions data from Google Ads is collected once you have authenticated cost, clicks and impressions collection in the Cost tab. Clicks and impressions data from Google Ads was made available during August 2018, first for Android apps and later on for iOS apps. Therefore, when analyzing clicks data from 2018 and before, Google Ads clicks data may be missing or incomplete. Why can't I see in-app events on Google Ads? Are you seeing this screen on Google Ads after mapping your preferred in-app events on AppsFlyer's dashboard (configuration step 3)? If so, then you need to perform these events on a mobile device AFTER the mapping takes place. It may take up to 6 hours afterwards for the events to show up on Google Ads' dashboard. Do I need to create and then import session_start? This depends on the type of campaign you are running. If you are running a re-engagement campaign then it is recommended to create and import session_start to measure engagements. For a user acquisition campaign, this is not mandatory. Does AppsFlyer display campaign level data? Yes! You can also view channel level data in the AppsFlyer main dashboard. Do I need to configure anything to create audience lists in Google Ads based on AppsFlyer data? No. In the Google API, this information is already set and is based on your In-App Event configuration. I'm Running an Apps campaign, why can't I see data or Conversion events in the AppsFlyer or Google Ads Dashboard? It is very likely that you have not yet imported events. For details about how to import events, click here. What do I do if there are multiple accounts? There is no problem using multiple accounts with Google Ads with AppsFlyer. AppsFlyer only works with one Link ID. Therefore, only one Link ID must be generated in Google Ads and this can be shared between multiple accounts. For more information, click here. Link IDs at MCC or account level are supported by AppsFlyer. We recommend working closely with your Google Ads representative to ensure your account is structured correctly. For more information, click here. Parallel tracking enables your landing page to load faster, reducing the issue of lost visits. As a result, conversions are increased and ad performance is improved. With Parallel Tracking, users are sent to the final URL, directly from your ad, before sending them to the tracking URLS, while click measurement takes place in the background. For a full explanation of Parallel Tracking, click here. Tracking Link Mismatch - Sometimes Google displays a notification that there is a mismatch between the Tracking URL and the final URL. This has no impact on measurement and attribution on the AppsFlyer side. To avoid this notification, when using the basic tracking template, you can add an additional URL parameter called af_r and use the value of the final app store URL. In most cases, Google does not enable third party tracking links, which includes regular tracking links and AppsFlyer's OneLink. AppsFlyer supports all app campaigns enabled by Google Ads. AppsFlyer can present any campaign information that is provided by Google. The campaign type (Search, Video, Display and Re-engagement) and associated information is determined by Google. It is recommended to configure App campaigns. For guidance on other campaign types, you should contact your Google representative. For details of these campaigns, click here. To support Android tracking, make sure that your app supports GAID (Google Advertising ID) and that it is passed to AppsFlyer through our SDK. For details of how to create conversion tracking, click here. If you want to further measure the success of your Mobile App Install campaigns in Google, you can send in-app events to your Google Ads account from your AppsFlyer account. For details of how to track your app conversions, click here. App campaigns allow you to promote your iOS app across Google Search, YouTube and Display in a single place of configuration. Generally, Google itself can't track iOS installs from search campaigns as the clicks come from mobile web sources, preventing Google from pulling the IDFA from the devices, and from performing ID matching. In contrast, iOS search on App Campaigns can be tracked by Google, for ads that are served on the Google Search App. Sometimes there are discrepancies between the Google Ads dashboard and the AppsFlyer dashboard. Google Ads does not hold this data. AppsFlyer uses last click attribution (more information about AppsFlyer attribution available here). Google Ads attributes the conversion to the Click time. AppsFlyer attributes the conversion to the launch time (app open). AppsFlyer’s reports are in real time. Google Ads, as an SRN, attributes all installs following engagements with Google Ads, within their attribution window. AppsFlyer attributes the last click only, and treats engagements before it as assists. Google Ads attributes the in-app event to the Click time. In the AppsFlyer dashboard in-app events are attributed according to the install time. In Raw Data Reports, AppsFlyer attributes in-app events according to the time of the event. Google receives all information from AppsFlyer regardless of validation rules. AppsFlyer might deduct a number of installs based on their validation rules. While Google Ads shows all installs of a retargeting campaign in the same place, on the AppsFlyer dashboard, installs are divided between the Overview page (new installs) and the Retargeting page (re-engagements). When comparing data from Google Ads dashboard and AppsFlyer, make sure that the data in Google Ads dashboard is data that is imported from 3rd party analytics (AppsFlyer). Data imported from Firebase or Google Play is structued differently and is not fully comparable with AppsFlyer data. To learn how to import data from AppsFlyer to Google Ads dashboard, click here. To compare install events (first_open in Google Ads), make sure that you drill down to install events in the conversion report in Google Ads. Google Ads might show all conversions (could be installs, purchases, subscriptions) which is why it is important to select only those install events out of all conversion events.